I had just decided that I wanted to go in a totally abstract interpretation direction with my art and along came Chris’s challenge for photo realism. No way to abstract that one. I first thought of simply scanning a painting from the past, print it on fabric and pump up the volume with paints. After I gave it a lot of thought, I decided that the challenge really demanded my full attention. I have been striving to design some simple pieces. The result is one of my most favorite things in the world…a chocolate sundae dripping over the bowl and sweet maraschino cherries on top. 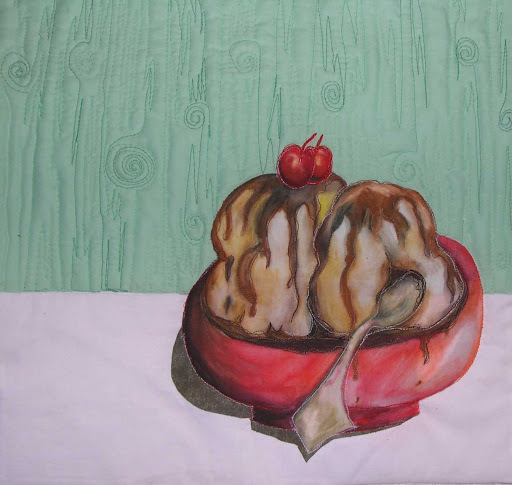 I drew the sundae on white muslin with inktense pencils and then shaded the ink when I applied water. I applied fusible web, cut it out and applied it to the white table top. For the shadow, after I cut out the sundae , I held it over the white background with a light source on the right. That gave me the correct shadow for the bowl. I quilted the wall in a wood grain to make it recede and the table and sundae come forward. The hard part was the foreshortened spoon. What was I thinking??? The table top was intentionally left without quilting since I felt it would make the piece too busy. So here it is, I hope you like it. Comments are always welcome and appreciated.